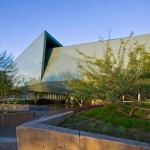 City of Tempe, Ariz., architects and engineers are no strangers to sustainable building design. 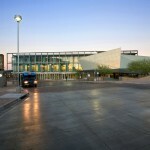 The $46.8 million East Valley Bus Operations & Maintenance Facility, which is owned and operated by the Arizona cities of Tempe and Scottsdale and Valley Metro, achieved two Leadership in Energy and Environmental Design (LEED) Gold certifications from the U.S. Green Building Council following its summer 2007 opening. So, it’s not surprising that the city’s latest work has taken its green building support up a notch. 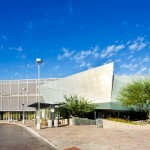 The Tempe Transportation Center – a mixed-use center of retail, city offices and leased office space that serves as a link for light rail, bus, bike and pedestrian activities – is one of the first transportation/community buildings in the nation to be submitted for LEED Platinum certification. 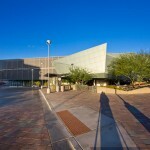 Included in the $25-million project is the 40,000-square-foot center that officially opened in December 2008, coinciding with the start of Metro light rail operations. 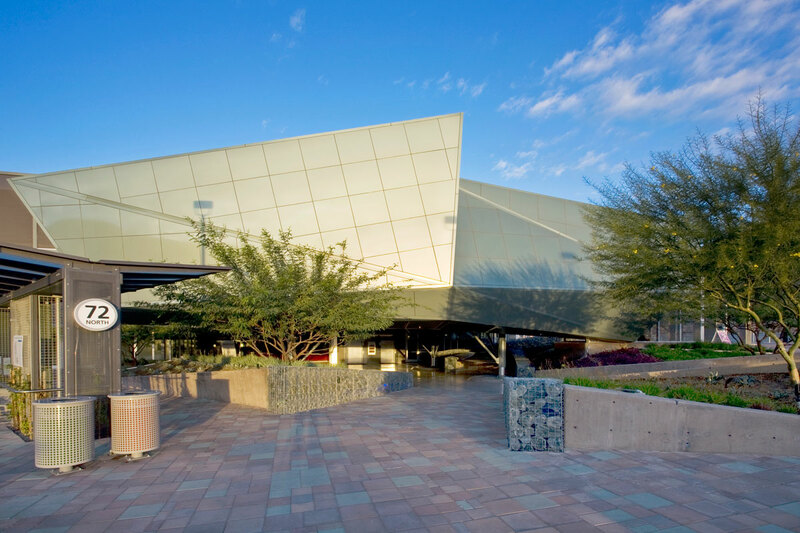 “We felt that the transportation center presented a real opportunity to showcase sustainability to the community and provide a source of information of what green building is really all about,” said Bonnie Richardson, AIA LEED AP, architect/planner, City of Tempe Transportation. 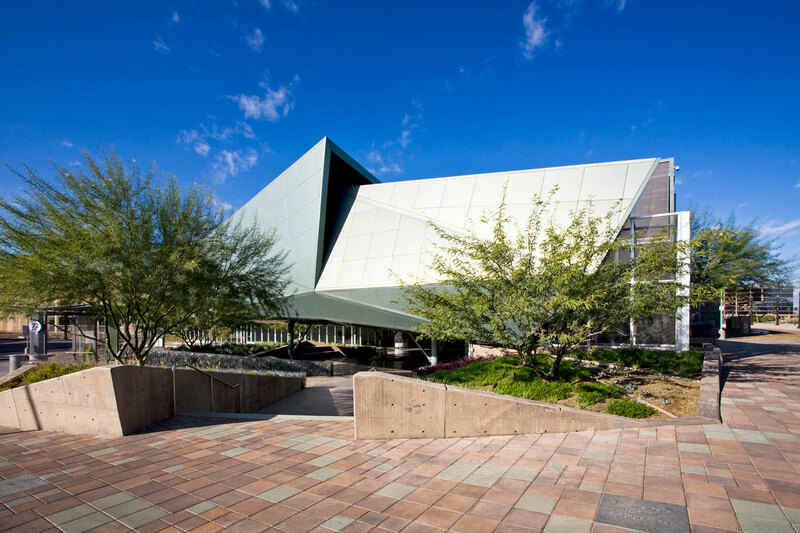 A narrow three-story office/retail building anchors the west side of the transit plaza, which unites light rail with buses, bicycles, the City of Tempe government plaza and the campus of Arizona State University. But the “jewel of the setting,” according to Richardson, is the center’s community room, which floats above an urban terrace. 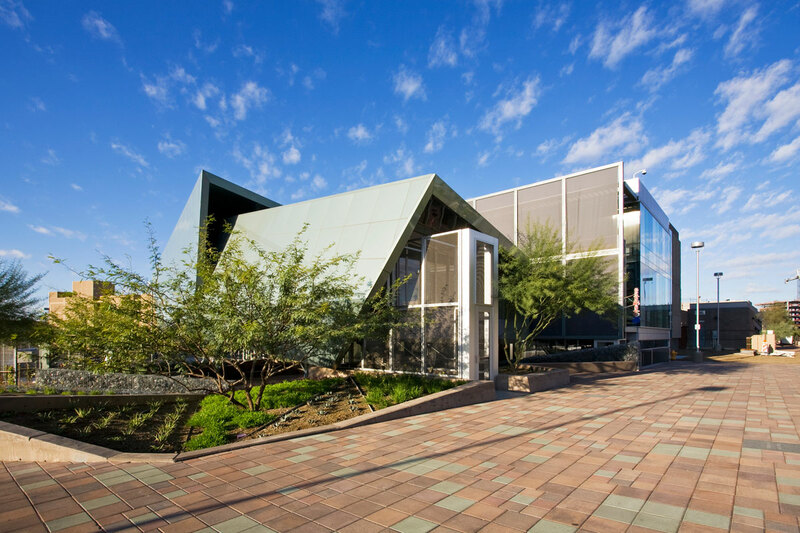 The community room’s appearance as a faceted gem is aided by Alucobond® Aluminum Composite Material, which clads the room’s walls and roof in the custom Spectra Green color and its underside in Platinum. Alucobond Spectra Colors – a new color finishing system for Alucobond – allow architects to incorporate a unique, ever-changing color spectrum in the cladding of sophisticated building designs. Alucobond Spectra Colors change colors as different wavelengths of light are reflected back to the audience, depending upon the viewing angle. The community room’s custom Spectra Green panels sparkle in the sunlight in shades ranging from a golden green to a deeper shade of green with any number of fine color variations in between, according to Richardson. 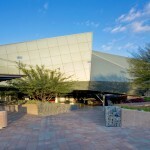 The center features a total of 16,000 square feet of Alucobond in the 4mm thickness, including 7,700 square feet of Alucobond Platinum and 8,300 square feet of Alucobond in the custom Spectra Green color. 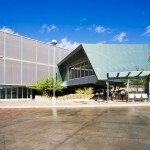 Elward Systems Corp., of Lakewood, Colo., fabricated Alucobond Platinum into 570 panels for the main building and 160 panels for soffits; the 1,200-square-foot community room alone required fabrication of 420 panels in Spectra Green, with 150 types of angled sizes created through precise 3-D shop drawings. 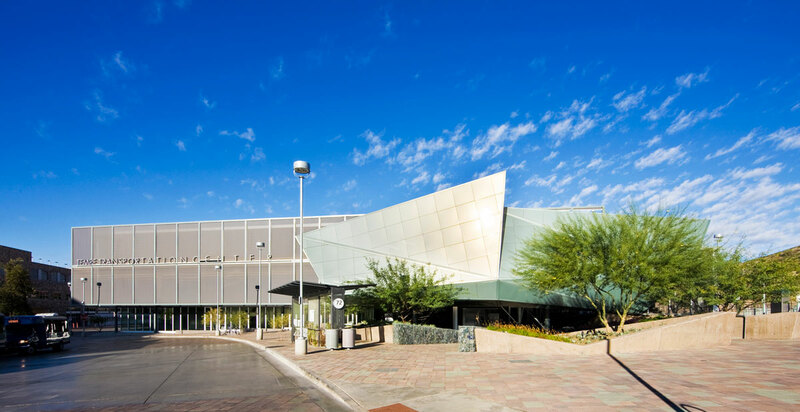 The Alucobond panels were installed by Elward Construction Co., of Tempe, with a route and return dry system on the main building and with a route and return wet system on the community room. Minneapolis-headquartered Adolphson & Peterson Construction served as general contractor for the project. 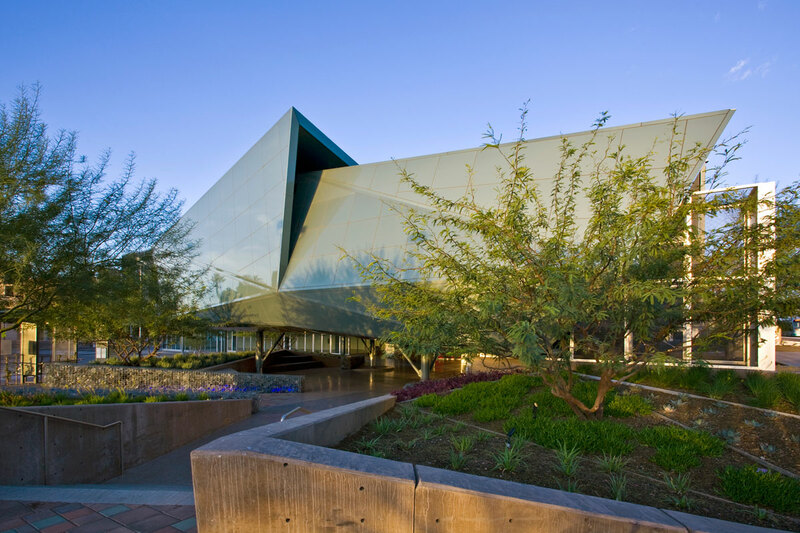 The project incorporates a variety of cutting-edge environmental strategies including the first climate-appropriate living roof (native Sonoran desert plants) and first gray water system ever to be utilized by a commercial building in the City of Tempe. The building was designed to be 52 percent more energy-efficient than buildings of its kind and features natural lighting and views in all regularly occupied office spaces. 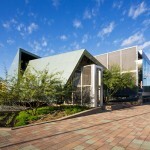 Additional green strategies include gray water/storm water recycling, solar bus shelters and an under floor air system. The climate responsive design and recycled content materials are unveiled through educational interactive “Green Touchscreen” in-wall teaching panels, and the first “Re-use, Recycle” signage program in the nation. 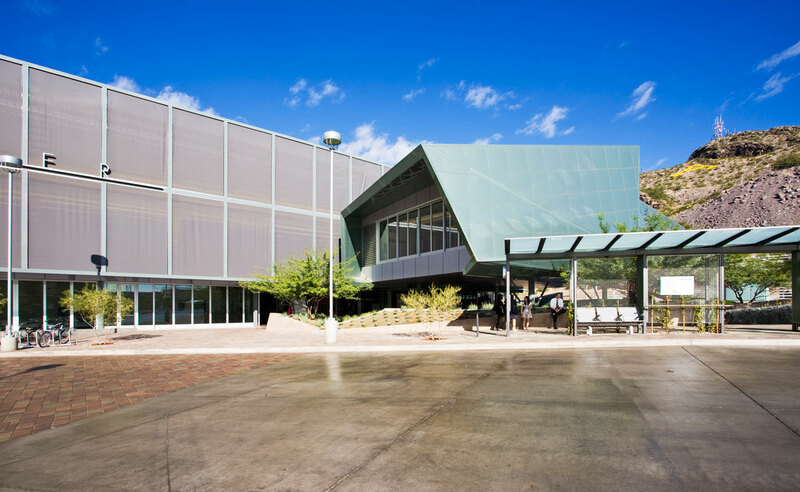 City of Tempe Transportation offices share space with the first bike station in Arizona, connecting Tempe’s 165 miles of bike path with secure indoor storage, shower/locker facilities and a bike repair/maintenance area. 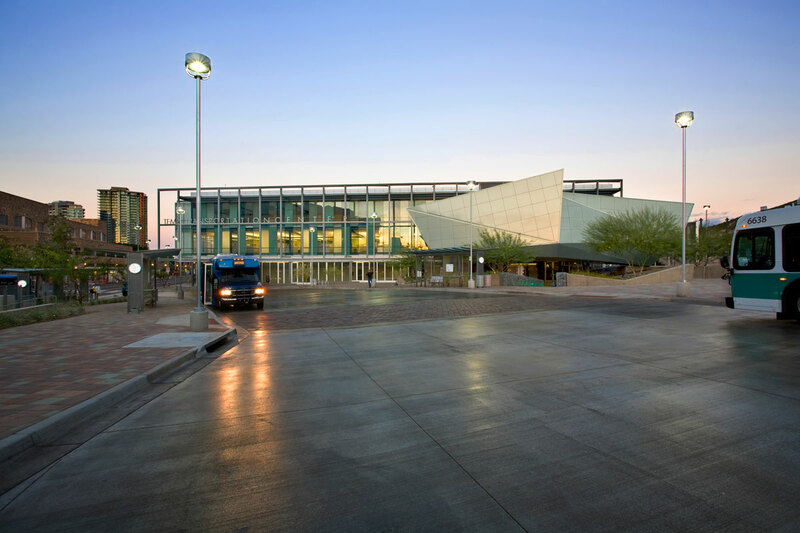 Thirteen bus bays serve local and regional passengers; and, shuttles connect downtown to neighborhoods and the Arizona State University campus. 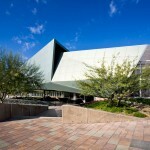 The Tempe Transportation Center was designed as an urban response to sustainability with the overall goal of submission for LEED Platinum certification. The building is designed as a 100-year facility, according to Richardson. 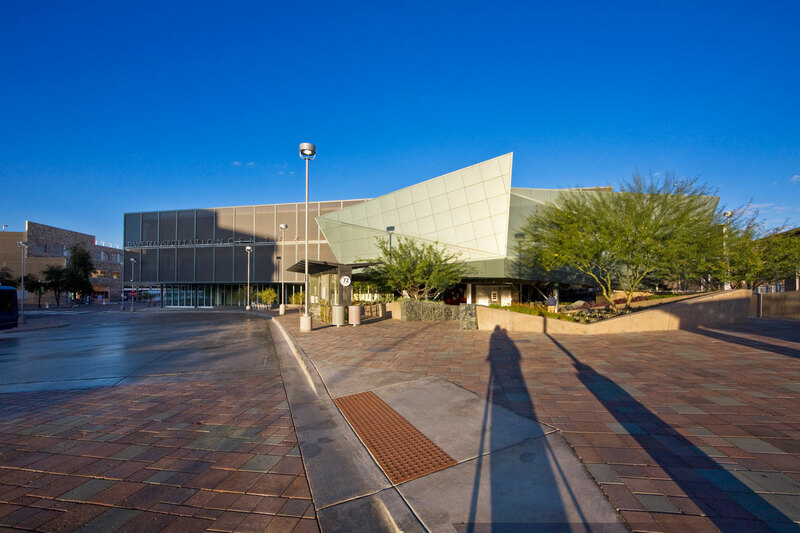 Sustainable strategies were incorporated in all aspects of the project from the public transportation site itself to the development of the innovative storm-water retention and re-use system and a 52 percent energy optimization in the building. (Current building operations have found that tenants do not turn on overhead lighting fixtures during the day, so energy optimization rates may be even greater, according to Richardson.) Recycled content was required in building materials, and construction waste was reduced by 90 percent. Alucobond not only met the project’s recycled content requirements and is recyclable itself, this material choice helped to minimize the number of materials and trades on the job site because it was able to be used to clad both the community room’s walls and roof, according to Kane. The mixed-use building is designed to attract retail tenants such as a café, newsstand, green-materials store or gift shop, in addition to leased office space. All tenants will be required to sign a green lease, according to Richardson, who said tenant build-outs of leased space must incorporate sustainable building products and recycling. In addition to the “Green Touchscreen” in-wall teaching panels, educational presentations describing the city’s sustainability and green-building programs will be conducted in the community room. The importance of green building and energy conservation may be dramatically emphasized by the community room itself during some of those community presentations. Window walls on both the north and south sides of the room can be opened for natural cooling.